Protecting workers through the inclusion of labour clauses in trade agreements has become more common since the first such causes were included in NAFTA, but some argue that by increasing labour costs in developing countries, they represent a form of protectionism. This column uses new data to argue that there is no evidence for adverse effects on trade from labour clauses. When such clauses are strong, and if they emphasise cooperation in their implementation, they have a positive effect on the commercial interests of developing countries. Labour clauses in trade agreements make preferential market access conditional on respecting a minimum level of workers’ rights. They protect workers by reducing incentives for multinational firms to relocate to countries with weaker worker protection to gain a competitive edge. They also reduce the incentive for a government that wants to attract economic activity to be part of a 'race to the bottom' in its regulation of workers’ rights. These seem legitimate goals in a world where technological progress and globalisation during the last three decades have been accompanied by a large decline in the share of labour income in GDP (IMF 2017). It is also in line with the UN's Sustainable Development Goal No. 8, on inclusive growth and decent work. Not everyone agrees that labour clauses should be part of trade agreements. Some argue that they hurt the commercial interests of low-income countries. Stronger worker protection may lead to the deterioration of these countries’ comparative advantage, as higher wages and better working conditions may price their goods and services out of world markets, and ultimately do the same to their workers (Golub 1997 and Panagariya 2006). Bhagwati (1995, 2001) also highlighted the potential for labour clauses to become instruments of protectionism in advanced economies that want to lessen preferential market access for low-income countries. This view was prominent in developing countries in the 1990s. It explains their refusal to introduce labour issues at the WTO either when it was created in 1994, or during the Singapore Ministerial Conference in 1996. There is an alternative view – that the inclusion of labour clauses in trade agreements leads to more trade from emerging and developing economies. This is based on the evidence that better worker conditions increase labour productivity. This in turn improves firm performance. In a case study of the Dominican Republic under the Dominican Republic-Central America-US trade agreement of 2004, Schrank (2013) found that trade-backed labour standard conditionality helped tackle labour law violations (through a stronger labour inspection system) and fostered skills building, which he interpreted as evidence that worker protection could be reconciled with strong firm performance. In 1999, the US signed a bilateral textile trade agreement with Cambodia. It linked preferential market access to labour standards compliance. The ILO’s Better Factories Cambodia programme monitors working conditions in Cambodian garment factories, and assesses conditions relative to ILO Core Labour Standards and Cambodian labour law. Using data from this, Brown et al. (2013) found that compliance with internationally recognised labour standards, in terms of labour management, was positively associated with firm survival and labour productivity. There is also a demand-side explanation for why labour clauses increase trade, based on the role of socially conscious consumers and firms in the global north. When those firms are engaged in global supply chains, labour clauses can signal to consumers and firms in developed countries that there is adequate worker protection in the low-income partner, which increases the demand for goods produced under socially acceptable conditions. When blatant labour rights violations in the global factories of major brands such as Nike made the headlines in the 1990s, activist groups like the anti-sweatshop movement formed and over time, they generated publicity about poor working conditions in global production networks. Under increased media scrutiny, and concerned about their reputation, multinational companies headquartered in the north began to set up voluntary codes of conduct, or other similar private initiatives (such as multi-stakeholder initiatives), to address poor labour standards in their global supply chains (Locke 2013). The response of firms was accompanied, perhaps propelled, by increased consumer awareness of sweatshops, and a consumer demand for goods produced under decent conditions of work (Elliott and Freeman 2003, Heinmueller and Hiscox 2012). In recent research, we try to disentangle whether the introduction of labour clauses in trade agreements led to more or less trade (Carrère et al. 2017). Because all arguments reviewed above focus on exports from low-income countries with weaker labour standards to high-income countries that have stronger labour standards, plus high awareness among some consumers and firms, we examine whether the direction of trade matters. We also explore whether the different designs of labour clauses within trade agreements affect their impact on trade flows. In particular, we distinguish between labour clauses with strong enforcement mechanisms and those with deep cooperation mechanisms on labour issues. Fortunately, Damian Raess and Dora Sari have recently built a new dataset (LABPTA dataset) that systematically documents labour provisions in preferential trade agreements. Their data suggest that even if labour issues have been ignored at the multilateral level, they are a prominent part of modern preferential trade agreements. 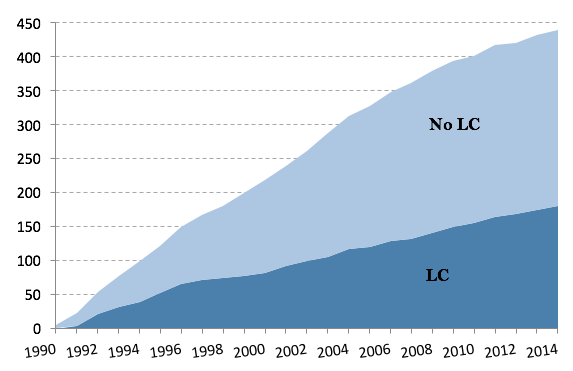 Figure 1 reports the number of trade agreements with and without labour clauses between 1990 and 2014. The first labour clause in a trade agreement between developed and developing countries was introduced in 1992 in NAFTA. It included legally binding commitments on fundamental workers’ rights and conditions of work regarding health, safety and wages, as well as strong enforcement mechanisms for domestic labour laws. By 2014, more than 40% of existing trade agreements included a labour clause. Source: Raess and Sari LABPTA database. Note: 'LC' includes all agreements with at least one labour provision. When we examine how often labour clauses were included by level of development, we find that labour clauses were common in trade agreements among advanced economies, and between advanced and developing economies. 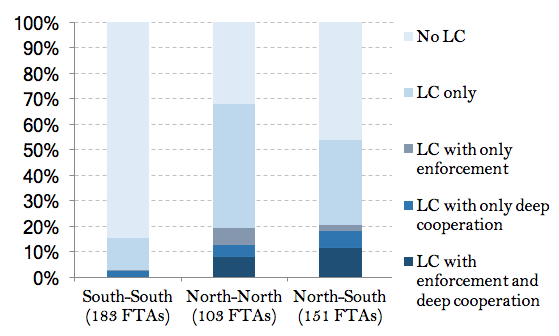 Among developing economies, labour clauses are present in fewer than 15% of their trade agreements (see Figure 2). This is not surprising – if labour clauses have an effect, it is likely to occur in trade agreements between advanced and developing economies. Figure 2 also distinguishes between labour clauses with shallow commitments, such as those trade agreements that commit only to “improve working conditions” in the preamble of the agreement (e.g. the Chile-Ecuador 2008 trade agreement), and those that include strong enforcement mechanisms (e.g. NAFTA) or deep cooperation provisions over labour issues (e.g. the EC-South Korea 2010 trade agreement). Note: LC includes all agreements with at least one labour provision. 'LC with enforcement' refers to trade agreements with a labour clause including both (i) judicial or quasi-judicial dispute settlement mechanisms and (ii) sanction measures (monetary compensation, trade sanctions, or 'other appropriate measures'). 'LC with deep cooperation' refers to trade agreements with a labour clause including cooperation-related labour provisions and a comprehensive institutional framework establishing a separate committee for the implementation of the labour-related commitments and allowing the involvement of third parties. Using the gravity framework for international trade, with bilateral trading relationships among countries that have signed trade agreements without a labour clause as a control group, we find that, on average, the presence of a labour clause has no statistically significant impact on bilateral trade flows. However, this average effect hides some important heterogeneity. Exports from developing countries with weak labour standards to high-income countries with strong labour standards increase significantly after the introduction of a labour clause. In all other types of bilateral trade relationships, the presence of a labour clause has no statistically significant impact. Because selection and endogeneity may be driving these results, we use an instrumental variable approach to ensure that there is a causal relationship between labour clauses and exports from low to high-income countries. We used as instruments labour union density, a measure of left-leaning governments, and potential labour power by Rudra (2002) of the country with the highest value within the trade agreement. The idea is that if a member of the trade agreement has a strong labour union, a left-leaning government, and low potential labour power, a labour clause is likely to be introduced in the agreement. The results of the instrumental variable estimator confirm that labour clauses led to higher exports from low- to high-income countries only. We also distinguished between shallow labour clauses, clauses with strong enforcement, and clauses with deep cooperation over labour issues, and found that the driving force behind the positive impact of labour clauses on exports from low- to high-income countries was the presence of labour clauses with deep cooperation, rather than strong enforcement, or shallow clauses. Our results suggest that the introduction of labour clauses in trade agreements helps, rather than hurts, the commercial interest of developing countries, and should not be seen as a source of trade protectionism. Moreover, building a country’s comparative advantage on weak labour laws and worker protection is unlikely to be a sustainable source of growth. It is difficult to see how child labour, slavery and badly paid workers embedded in a country’s exports can help its development prospects. If labour clauses are a prominent feature of modern preferential trade agreements, the time has probably come to introduce labour issues at the multilateral level. Bhagwati, J (2001), "After Seattle: Free Trade and the WTO", International Affairs 77(1): 15-29. Bhagwati, J (1995), "Trade Liberalization and ‘Fair Trade’ Demands: Addressing the Environmental and Labour Standards Issues", World Economy 18: 745-759. Brown, D, R Dehejia, and R Robertson (2013), "Is there an efficiency case for international labour standards? ", International Labor Organization Better Work discussion paper series, No. 12. Carrère, C, M Olarreaga and D Raess (2017), "Labor clauses in trade agreements: worker protection or protectionism? ", CEPR Discussion Paper Series No. 12251. Elliott, K and R Freeman (2003), "Can Labor Standards Improve Under Globalization? ", Institute for International Economics. Golub, S (1997), "International Labor Standards and International Trade", International Monetary Fund Working Paper No. 97/37. Hainmueller, J and M J Hiscox (2012), "The Socially Conscious Consumer? Field Experimental Test of Consumer Support for Fair Labor Standards", MIT Political Science Working Paper No. 2012-15. IMF (2017), World Economic Outlook, Washington DC: International Monetary Fund. Locke, R M (2013), The Promise and Limits of Private Power: Promoting Labor Standards in a Global Economy, Cambridge: Cambridge University Press. Panagariya, A (2006), "Trade and Labor Standards: A Trade Economist’s View", Integration & Trade 10: 261-280. Rudra, N (2002), "Globalization and the Decline of the Welfare State in Less-Developed Countries", International Organization 56(2): 411–445. Schrank, A (2013), "From disguised protectionism to rewarding regulation: The impact of trade-related labor standards in the Dominican Republic", Regulation & Governance 7: 299-320.